Allows for a free analytical expression of a wave function $ \psi$. x: Spatial Dimension - Can be used as "x" in the expression. Scalar - Can be used as "a" in the expression. Scalar - Can be used as "b" in the expression. Any analytical expression allowed by the Composer's Expression-field can be written in the textfield. 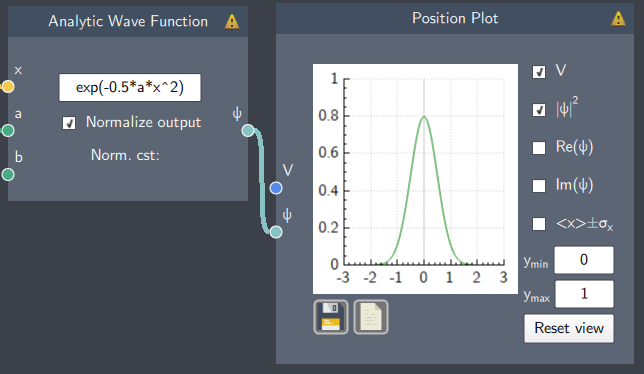 The wavefunction can be used either directly, or it can be numerically normalized by checking the "Normalize output"-checkbox. In this case the node also displays the normalization-constant multiplied onto the expression. Numerical normalization of wavefunctions is described on the Normalization-page.